Letter to US Dept. of State, Peggy Gennatiempo requesting assistance from the American Embassy in Madrid. Please see below the contents of my email sent to the American Embassy on February 4, 2013. I am currently preparing an official complaint to the Colegio de Abogados for the professional and criminal negligence of my lawyers of the past 6 years, enumerating the constitutional and civil rights violations created by said negligence (see http://worldpulse.com/node/52999.) However, documents and court-records, which I wish to submit as supporting documentation, are in the possession of legal counsel Miguel Martínez López de Asiain and Ignacio Gonzalez-Martínez, C/ Santisima Trinidad, 11, 28010 Madrid, Tel. 91.445.1177. Due to their elevated negligence and financial liability for said negligence, the probability of said documents being lost in the mail is almost a certainty, and I respectfully request that the American Consulate in Madrid assist me in the recuperation of these documents. Unfortunately, due to continuing deterioration of my ex-husband’s mental state, his past threats upon my life, and law enforcement officials, Spanish tribunals and legal counsel’s refusal to assist or protect me or my rights in legal proceedings, at this time it would be dangerous and unwise for me to enter Spanish territory in order to personally recuperate said documents. My suggestion is that Mr. Martinez Lopez de Asiain or Ignacio Gonzalez-Martínez personally delivers said documents to the US Consulate in Madrid, to a person designated by the US Consulate to receive said documents, and which are then sent to the US State Department, Consular Affairs Division in Washington, DC, from whom I might personally recuperate the documents in question. As an American Consul General of Madrid, you are familiar with reports by Amnesty International Spain of the widespread failure of Spanish judicial systems to protect victims of domestic abuse, the escalating rate of women murdered at the hands of their partner in Spain, as well as widespread harassment, ill-treatment and torture of foreign women by Spanish law enforcement officials. The problems I have encountered with law enforcement officials, and violation of rights in judicial proceedings, is rampant and common-place in Spain, and not an “isolated” incident. Additionally, you are familiar with the Inter-American Commission on Human Rights and European Courts of Human Rightsdecisions,Jessica Gonzalez vs. USA, A vs. UK, and Velasquez vs. Honduras, establishing domestic violence as a human rights violation, as well as a State’s obligation to protect victims under the principle of due diligence. My complaint to the Colegio de Abogados of Madrid against my legal counsel is based upon the question of due diligence, and whether said counsel exercised due diligence in defense of my interests and rights under the Spanish Constitutional and Spanish law. 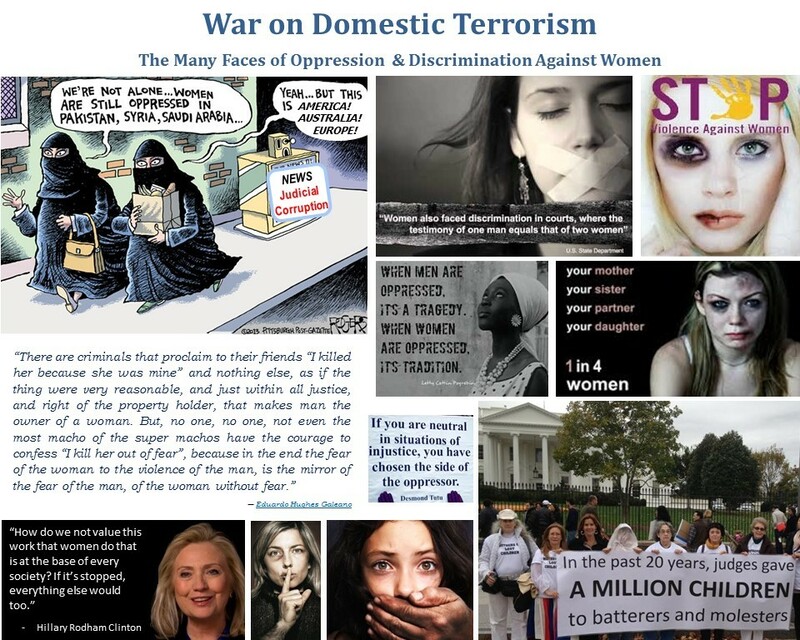 In the past 6 years, US State Department officials in Madrid and Washington, DC have continually contended that domestic abuse and the failure of governments to protect citizens living within their jurisdictions are “civil” and “private” matters, and that the American government has no obligation or duty to protect the rights or interests of their citizens on foreign soil, or within foreign tribunals. Seventy percent of international child abduction cases under the Hague Convention are women fleeing domestic abuse and a government’s failure to protect. These women are being held to the letter of the law by sending and receiving States, facing criminal charges and incarceration for extend periods of time. In my own case, The American Consulate in Madrid and US State Department officials in Washington, DC have repeatedly informed me that my case is under Spanish jurisdiction and law, with an obligation to abide and respect these laws and jurisdiction. In this same spirit, I am requesting that my legal counsel and other judicial actors in Spain be held to the same standard; anything less is discrimination against women and in violation of Spanish and international law. For your convenience I have enclosed a copy of all previous correspondence with the US State Department in regards to my case (also posted on UNCSW – Document #5 – Correspondence with US State Department officials), as well as my complaint to the United Nations Entity for Gender Equality and the Empowerment of Women – Commission on the Status of Women against the Spanish government for systematic human rights violations (posted on http://worldpulse.com/node/55730.) My complaint as well as supporting documents demonstrates that my case is far from “isolated,” but rather the norm in family courts. Thank you for your response. If the documents in question cannot be included in the Embassy’s pouch to the US State Department here in Washington, DC, as I suggested, then please feel free to send them to me in the USA. If you can indicate what the costs would be, I would be happy to wire the money to an account in Spain or the USA. Please assure that they are sent by the least expensive manner possible, as I appreciate they must be quite voluminous at this point. Thank you for informing me about the possibility of filing a complaint with the Colegio de Abogados. But, as indicated in my correspondence, I have already prepared a comprehensive and detailed analysis of all criminal and professional negligence of my legal counsel (posted on http://worldpulse.com/node/52999.) I will be filing this complaint with the Bar Association as soon as I receive the few pending documents needed, and found within the documents in possession of Srs. Martinez Lopez de Asiain and Ignacio Gonzalez-Martínez. As you may note in the attached correspondence, in my efforts to arrive at a settlement with negligent legal counsel and in good faith, I have not been attempting to recuperate total financial damages, but only enough to assure that Global Expats and www.global-xpats.com will be “reinstated” to its former competitive position in the local search-city guide industry (See www.yelp.com – http://www.yelp.com/press/announcements) when it was launched in 2007. As you may note in the attached documents, and the facts of my case, the escalation of the violence and threats upon my life and person from my ex-husband, along with his other criminal activity, have all been with the expressed intent of destroying my website and company, thereby prevent me from providing financial security for me and my children (and believe it or not my ex-husband, the father of my children.) The negligence of my legal counsel is directly, and solely, responsible for my inability to develop this website in the past 6 years. As my case demonstrates even though under the law, women are afforded more rights in Spain than any other country in the world (including the USA), in reality they have no more rights than women under Sharia law, due to widespread negligence, discrimination and corruption in Spanish judicial systems. The lack of good faith of Quatrecasas, Gonçalves Pereira, Plehn Abogados (Ms. Belen Garcia Martin,) Martinez Lopez de Asiain, and Ignacio Gonzalez-Martínez in assuming responsibility for their and/or their partners negligence, taking action to repair damages created by their partners (as called for under Spanish law) and arrive at an equitable settlement, avoiding further escalation of the case at hand and reclamation for significant financial damages, is regrettable. What should have been a rather simple and straight-forward divorce/domestic abuse case, as the evidence of my ex-husband’s manipulations and criminal activity in the past 10 years, is over-whelming; the elevated negligence of my legal counsel and their alleged criminal activity has created a complicated and convoluted case falling under a variety of jurisdictions and laws. My market research and analysis of the Internet (Web 2.0 and 3.0) and how the infra-structure and business model trends on the Internet can provide a comprehensive solution to the challenges of expats and their employers. All documents and correspondence in regards to my case are posted on http://worldpulse.com/user/2759/journal (complaint against legal counsel posted on http://worldpulse.com/node/52999) and self-explanatory. But, I am available to answer any questions, or clarify any issues which remain unclear. It is my greatest desire to move forward with the creation of Global Expats, be re-united with my children in the briefest delay possible, and move on with my life and work. I believe this would be in the best interest of everyone; implicated legal counsel, afore mentioned Spanish regulatory agencies, the Spanish government, the US State Department, and the American government. I hope implicated legal counsel will be encouraged at present to demonstrate their good faith, and examine the facts of the case at hand. Avoiding a protracted, high-profile case in the international courts, by arriving at an equitable financial settlement, would be in the interest of all parties. Thank you for your time, interest and assistance. Amnesty International report to the Office of High Commission on Human Rights http://worldpulse.com/node/52999Beauty Solomon vs.